The famine in the Horn of Africa used be blame mainly for the drought caused by the global climate change ignoring the pricipla culprit the the dictatorial regime. In the past the same has brought regime change in country of hunger Ethiopia two times, that of the Negus in 1974 and the Derg Military Junta in 1991. As the French says there is no two without three, we expecting a regime change in the country since all conditions are meeting as those of the last two experiences due to the starvation in Wello in 1974 and in Tigre in 1984 which cost the lives of millions in the past. The main culprit for this in human repeated catastrophe this day has been mainly given to the extreme weather conditions demonstrated by hurricanes, floods, droughts all over the globe. 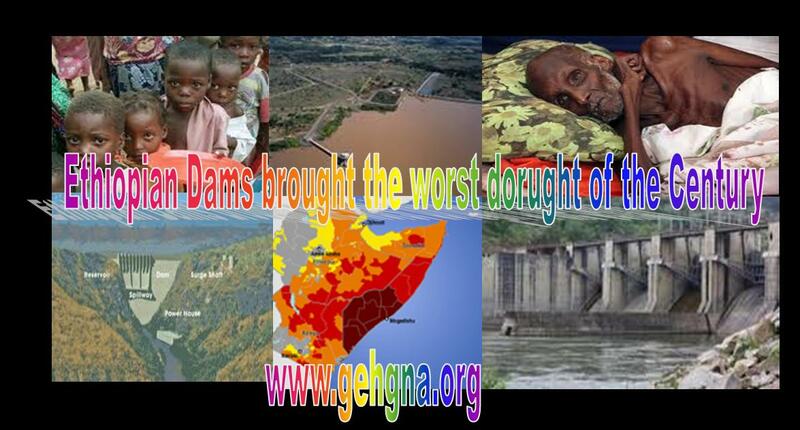 The current drought conditions have been caused by successive seasons with very low rainfall due to wanton construction of the dams all over Ethiopia by the dictatorial regime of Melese Zenawie. Over the past decade the Horn of Africa has experienced consecutive failed rainy seasons having direct co-correlation in this period of intensification of damming in the region. According to surveys of local communities, this is part of a long-term shift as seen in Borana communities in Ethiopia report that whereas droughts were recorded every six to eight years in the past, they now occur every one to two years since the construction of dams in Omo and Shebelle rivers. Today’s rainfall projections are unclear. Most modeling, as reflected in the IPCC’s last assessment, suggests more rain will fall in the east Africa region as a whole, with an increase in “heavy events” (sudden downpours, so more flood risk). However, some recent studies suggest rainfall will decrease, particularly in the long rains. To reverse the trend the regional governments must stop wanton damming and wasteful irrigation likes that of Sudan and Ethiopia. According to IPCC’s last assessment, suggests more rain will fall in the east Africa region as a whole, with an increase in “heavy events” (sudden downpours, so more flood risk). However, some recent studies suggest rainfall will decrease, particularly in the long rains. Since the construction of the Mega dams in the Southern Ethiopia the regional meteorological data supported the argument by demonstrating the increase of the annual temperatures from 1960-2006 by 1C in Kenya and 1.3C in Ethiopia, and the frequency of hot days is increasing in both countries in the region of the dams. However, more recent research suggests that rainfall decreased in the rainy seasons of March to June. When it comes to records and data collections like Europe and America climate change could not be attributed to the Horn of Africa’s drought, since t the current drought is directly climate change. True, there are now a few cases in which scientists have been able to estimate the extent to which man-made climate change has made a particular extreme weather event more likely, but these exercises require reliable long-term weather data that only exists for Europe and North America – no such studies as yet exist in the case of the current drought. What about the future? Globally, climate change modeling projects an increase in the frequency and severity of extreme weather events like droughts and floods. In the absence of urgent action to slash global greenhouse gas emissions, temperatures in the region will probably increase by 3C-4C by 2080-99 relative to 1980-99. The combination of higher temperatures and more unpredictable rains is alarming for food production. In a recent estimate horn of Africa could suffer a decline in the length of the growing period for key crops of up to 20% by the end of the century, with the productivity of beans falling by nearly 50% if the dictatorial regimes continue letting land grabbing and disfranchising the local family hold farmers and pastoralist for the sake of this international speculators. More over, the dam is prepared for these grabbed lands irrigation for an eventual cash crop cultivation of exportation. According Nobel prize-winning economist Amartya Sen that drought is caused by lack of rainfall, famine is man-made, and thus famines do not occur in functioning democracies. Drought, Famine in Horn of Africa: Preventable? The dire situation in the Horn of Africa has many asking — why is this happening again? 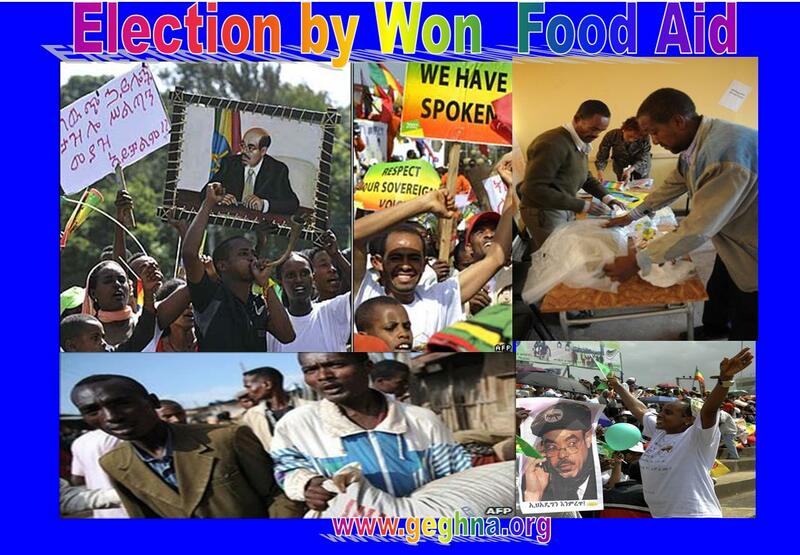 Ethiopia indexed worst of the 25 alarming…& Eritrea figured with the Most alarmingly Hungry . Muse Tegegne, Prof.
Ethiopia is indexed among 25 hungry countries where over 53 % children are stunted, while in Eritrea more than 50 % are starving according to IFPRI. Ethiopia Ranked the worst among the 25 least to greatest levels of hunger, they included: Nepal, Tanzania, Cambodia, Sudan, Zimbabwe, Burkina Faso, Togo, Guinea-Bissau, Rwanda, Djibouti, Mozambique, India, Bangladesh, Liberia, Zambia, Timor-Leste, Niger, Angola, Yemen, the Central African Republic, Madagascar, the Comoros, Haiti, Sierra Leone, and Ethiopia. Eritrea figured among the most alarming countries with Congo DR & Chad. ‘Alarming’ numbers go hungry in 25 countries including Ethiopia due to poverty, conflict, and political instability causing some billion people to go hungry this year, many of them children in Africa and Asia, according to the Global Hunger Index of 11th of October, 2010. Out of 122 countries included in the annual report, of IFPRI, Ethiopia & Eritrea are among 25 hungry countries where 53 % children are stunted & More than 50 % are starving. The overall number of hungry people surpassed one billion in 2009, even though it decreased to 925 million in 2010. Over 20 billion is from Ethiopia not shown in the index. Though the Democratic Republic of Congo (DRC) fared the worst in the hunger index, which is based on data from 2003-2008, the 2009 and 2013 which is not covered by the IFPR will put surely Ethiopia among the extreme situation despite the double score economic growth announced t by the dictatorial regime of Melese Zenawie. The index ranked countries on a 100-point scale, with zero being the best score—no hunger—and 100 being the worst. 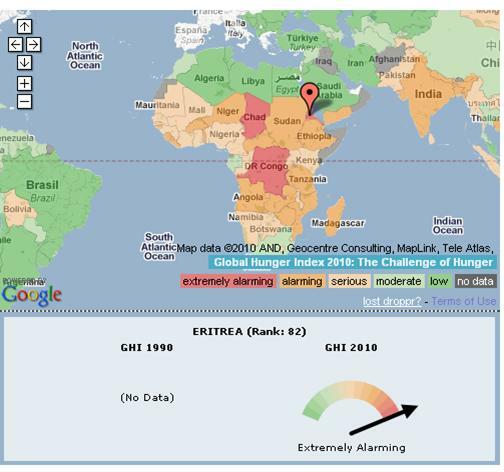 A score higher than 20 indicated “alarming” levels of hunger and above 30, “extremely alarming” hunger. The DRC was the only country in this year’s index with a score above 40. The other three countries with extremely alarming hunger levels were Burundi, Eritrea, and Chad. All have been involved in simmering or open conflict for many years. With the exception of Haiti and Yemen, all 25 countries with “alarming” levels of hunger were in sub-Saharan Africa or Asia. Burundi, Chad, the Democratic Republic of Congo (DRC), and Eritrea have the greatest levels of hunger. Angola, Chad, and Somalia have the highest under-five mortality rates at 20 percent or more. More than 50 percent of people in Burundi, the Comoros, the DRC, and Eritrea are undernourished. In Burundi, Madagascar, and Malawi, 53 percent of children are stunted (low height for their age); in Ethiopia and Rwanda, the figure stands at 51 percent; and in Niger, 47 percent of children are stunted. More than one-third (34 percent) of Mali’s children are stunted, and 11 percent suffer from wasting (low weight for one’s height). Stunting levels were nearly the same in 1996, and the prevalence of wasting has more than doubled. Based on the 1990 and 2010 GHI scores, the DRC has experienced the greatest deterioration in hunger, largely because of conflict and political instability. The DRC also has the highest proportion of undernourished people—three-quarters of the population—and one of the highest child mortality rates in the world. Three over half of the population in Ethiopia and Eritrea is under-nourished. The proportion of undernourished people and the child mortality rate in each country were among two of the three factors used to compile the index. “In order to improve their hunger index, countries have to accelerate efforts to reduce child under-nutrition,” with a particular focus on the 1,000 days from conception to the age of two. Adding to the above confirmation that :- “a child is not properly nourished during that period, there is “absolutely cast-iron, empirical proof” it will have “profound” long-term consequences, which ultimately going to have an impact on a country’s capacity to grow economically and socially in the future,” Tom Arnold, CEO of Concern Worldwide affirmed. Hunger mitigation programs that failed to focus on children under put Ethiopia “alarming” hunger index despite its relatively high gross domestic product per capita claimed by the dictatorial regime who blow up the growth. Yet the true progress was found elsewhere, especially in Southeast Asia and Latin America, which both slashed their hunger indices by more than 40 percent since 1990. Eight of the nine countries in which the hunger index went up between 1990 and 2010 were in sub-Saharan Africa mostly in Ethiopia and Eritrea. The 2010 Global Hunger Index (GHI) offers a useful and multidimensional overview of global hunger while the two countries of the horn of Africa boasted as fulfilling the Millennium Development Goals by 2015 (MDGs). Relief Help must be dressed to victim not through the embattled Governments of Ethiopia. Muse Tegegne, Prof. In case of Ethiopia after the 1980s Bob Guldof’s detoured Band Aid experience all the relief must be given directly to the people. One must not even address the rebels since they will take the starving population as a hostage as a means to win the war. When it comes to the government who is the main cause of the famine itself will use food to punish those who are not loyal or voting for him. In either case we have learned from the last 40 years experience that Aid must be directly delivered to the population suffering. We think also this the only methodology to be applied as a principle in any relief distributions in any country like Ethiopia known as mainstay of government instigated famine and conflict. The actual government in Ethiopia made its way to power by robbing relief and Aid from the starving population and buying guns instead. Today in power continues to benefit from the international aid to use it to maintain itself in power and dump the money in the international fiscal paradises across the pacific. Still today those part of the population who are not the same ethnic group as the group in power or others who are not pro government groups will starve to death. When a natural disaster hits a country a like Chile and Haiti the national infrastructure is also damaged and most of the avenues of delivery are closed. In the last case the international organizations must directly deliver to the people first and then help the government re habilitate itself but not on the back of the starving population. We must not forget that the government was suppose to work for the people a not the vice versa. Should you consider your feelings about a country’s government when deciding to donate to disaster relief? A decision to donate towards disaster relief will be determined by a number of factors, but support or otherwise for the government of the country affected, should not be one of them. Modern worldwide news coverage can bring details of disasters right to the heart of our living rooms. Reporters, photographers and their producers are adept at being in the right place at the right time, sometimes regardless of their own personal safety, and through their skill and courage we are made aware of the personal tragedies which may unfold after a disaster. The quality and empathy shown in such reporting can be a decisive first element in a decision to donate. Michael Buerk’s report for the BBC in 1984, from famine torn Ethiopia, led to a sudden awareness of the horrors unfolding and a tremendous outpouring of generosity from ordinary people. We see the needs of those affected – housing, food, water, medical supplies, clothing, warmth, etc., etc. and we feel unable, in all conscience, to not donate towards their relief. But do we pause to consider the government of the country affected? We may, but this should not affect our decision. It will not be the government which has caused the problem, and it may be doing all it can in the most difficult of circumstances. Were we to consider that we do not support the government personally, perhaps because it is too extreme, or because it has a reputation for corruption, should this affect our decision to donate? I hope not. The people most affected by a tragedy will need help whatever their government does or does not do, and the less effective the government is, the more those people need our help. Many examples come to mind. The Haitian government was in no position, for a variety of reasons, to offer organised assistance following the earthquake there. Does that mean we should not give? After the Armenian earthquake in the early 90s, people sat around waiting to be told what to do, the communist regime of several generations having removed their ability to decide for themselves. Does that mean we should not have given? And, closer to home, the American government’s failure to act quickly and decisively when New Orleans needed so much help appalled people throughout the world. But should this have affected whether people donated or not? Again, I hope not. From Live Aid in the mid-1980s to today, Western attempts to help famine-plagued Ethiopia have had little effect. Peter Gill explains why in “Famine and Foreigners.” William Easterly reviews. If it were possible to sum up in one sentence Ethiopia’s struggles with famine over the past quarter-century, I’d suggest this: It’s not the rains, it’s the rulers. 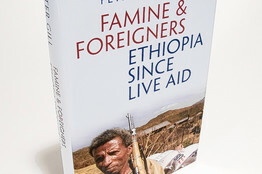 As Peter Gill makes clear in “Famines and Foreigners,” his well-turned account of the country’s miseries since the 1984-85 famine and the Live Aid concert meant to relieve it, drought has not been as devastating to Ethiopians as their own autocratic governments. Ethiopia is a classic example of Amartya Sen’s dictum that famines don’t occur in democracies, only under tyrannies. The “foreigners” in Mr. Gill’s story either didn’t know about this sad fact of life or chose to ignore it. In any case, the celebrities and humanitarians who rushed to the aid of starving Ethiopians in the mid-1980s unwittingly supported the very people most responsible for those grim days. he Derg, the brutal Marxist junta running Ethiopia at the time, contributed to the 1984 famine by forcing farmers to sell crops to the state at low prices. Many farmers instead consumed much of what they grew. The tradition of Ethiopians in areas with surplus food selling it to those in famine-stricken areas was thus disrupted. And then the Derg forced people to resettle in the southern lowlands from the parched northern highlands, partly in an effort to undermine the recruiting efforts of the Tigrayan rebels. One instrument of coercion: the relief supplies sent by well-meaning foreigners. The Derg denied food and medicine to anyone who refused to resettle. The refugees arriving in the lowlands found unfamiliar diseases and unsanitary conditions. The veteran aid writer Alex de Waal, assessing this era in Ethiopia, concluded: “Resettlement certainly killed people at a faster rate than the famine.” The aid also allowed the government to reduce its own spending on the domestic emergency and instead buy imported arms, which amounted to billions of dollars at the height of the famine. It took until 1991 for the guerrilla alliance to finally oust the regime. Mr. Gill captures the brutality of the Meles regime, but he does not say as much as he might about the government’s failure to address Ethiopia’s perpetual food shortages. He supportively describes Mr. Meles’s decision to continue the Derg’s policy of government ownership of all land. One searches in vain for a suggestion that letting farmers own their land might be a good idea, giving them incentives to prevent erosion and invest in soil fertility. The timing could not have been worse. In 2005, Mr. Meles was also serving on British Prime Minister Tony Blair’s Commission on Africa, a high-profile panel whose report called for increased aid to Africa. The G8 summit in Gleneagles, Scotland, in July 2005 was focused on Africa—particularly in response to the Blair commission’s report. The Live 8 concerts held at that time were an homage to the Live Aid concert two decades earlier and aimed at mobilizing public pressure for the G8 to indeed increase African aid. Yet few reporters covering the G8 summit, and surely few members of the Live 8 concert audiences around the world, seemed to grasp the key role played by Mr. Meles, an autocrat who had just rigged an election, killed demonstrators and imprisoned opponents. 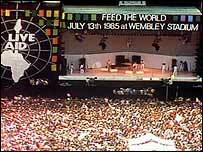 It was the political cluelessness of Live Aid all over again. In recent years donors have steered aid away from Ethiopia’s central government and toward local governments. Such efforts have had little effect, though, since the former controls the latter. If anything, the Meles regime has become harsher still. In “Famines and Foreigners,” Mr. Gill shows us the nexus of politics and aid at the core of Ethiopia’s famines. Surely little good can come of Westerners offering their help to Ethiopia in ignorance of the cruel way the country is governed. An ancient land with roots stretching back thousands of years, Ethiopia is in many ways culturally, linguistically and historically distinct from much of the rest of Africa. But like many African nations, agriculture is the foundation of the Ethiopian economy. The country’s wellbeing is dependent on uncontrollable factors including rain, climate change and the global market. Droughts in 2008 and 2009 continue to affect the food security situation of 5.2 million inhabitants of Africa’s second most populous country. Certain areas are currently facing droughts and flooding. Ethiopia has recently made huge gains in primary school enrollment, rural road investment, health extension system expansion and food security programmes. Despite these achievements, Ethiopia remains highly vulnerable to food crises, with food insecurity linked to rainfall patterns, land degradation, population density and infrastructure development. Of Ethiopia’s 79 million inhabitants, about 28 million, or 35 percent of the population, live below the poverty line. Eighty percent of the population lives in rural areas with limited access to infrastructure, making it difficult for food, healthcare and other resources to reach the area. Ethiopia is a least developed country ranked 171 out of 182 countries in the UNDP Human Development Index for 2009. In 2010, WFP will assist almost ten million people in every region of Ethiopia. The Government of Ethiopia continues to address food insecurity through its Plan for Accelerated and Sustained Development to End Poverty (PASDEP). All WFP activities in Ethiopia contribute to PASDEP. The main intervention in 2010 provides emergency food assistance to up to 4.7 million people highly affected by temporary food insecurity. WFP is also a major partner in Ethiopia’s Productive Safety Net Programme (PSNP), which reaches 7.5 million rural dwellers with much-needed support while generating community assets. Launched in 2005, the programme provides transfers of food or cash, or a combination of both, to help bridge food deficit periods and to ensure people do not sell their assets in order to meet their basic food needs. In addition, WFP also provides food assistance to Somali, Eritrean and Sudanese refugees, people affected by HIV/AIDS, and pregnant and nursing mothers and children suffering from malnutrition. Many pilot projects, such as the Risk Insurance project, are launched in Ethiopia. WFP Ethiopia’s Development Programme consists of two core components: School Meals and MERET (Managing Environmental Resources to Enable Transition), a programme supporting sustainable land and water management and increased productivity in food-insecure communities. MERET was recognized at the Copenhagen Climate Conference at the end of 2009 as one of the ways to combat climate change. It has great potential for countries that are unable to withstand climate shocks and proves how community-based land and water management can halt serious environmental deterioration. The School Meals component and the Children in Local Development (CHILD) initiative focus on supporting formal education and on enhancing child-friendly schools by developing schools into community resource centers that promote good nutrition and environmental awareness. WFP is working to connect farmers in Ethiopia to markets through the Purchase for Progress initiative. The MPI Multidimensional Poverty Index of the Oxford and the UN put the Ethiopia the 2 poorest country in the world while the Economist put it 1st, based on demographic morbidity and growth index. According United States Agency for International Development Ethiopia is one of the poorest and most food-insecure countries in the world. 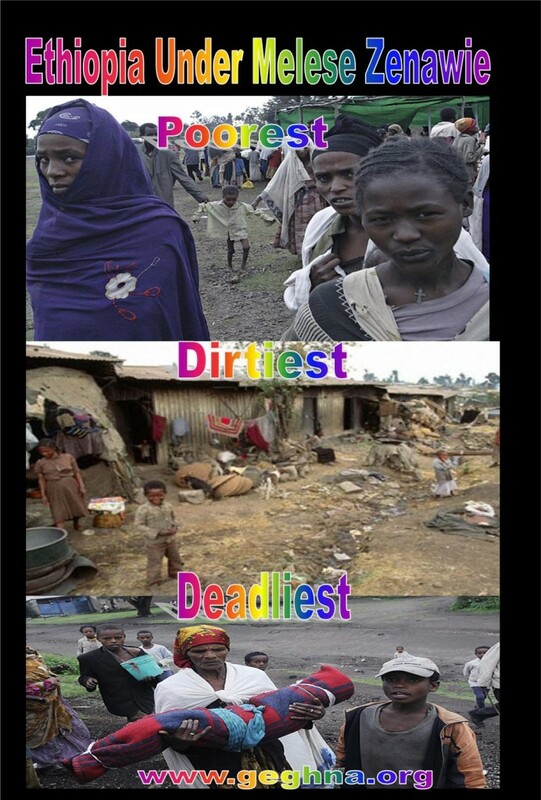 And the African capital Addis Ababa is the 6th out 25 Most Dirtiest Cities In The World. The famine has become a disese with no cure in Ethiopia and the recurring famine shows the same story, same pictures since mid 1970. Ethiopia is rulled by Live Aid funded rebels who came to power robing the Aid money and they hold on to power by the same endemic in human catastrophe they keep on provoking as a means to keep power. Ethiopia Needs international intervention blockage to stop Melese Zenawie, but not finical Aid to perpetuate his dictatorship. According to MPI Multidimensional Poverty Index put Ethiopia on the 2nd place in the contrary to Melese Zenawies double digit Index. Show all the deprivations that impact someone’s life at the same time – so it can inform a holistic response. Show which deprivations are most common in different regions and among different groups, so that resources can be allocated and policies designed to address their particular needs. Reflect the results of effective policy interventions quickly. Because the MPI measures outcomes directly, it will immediately reflect changes such as school enrolment, whereas it can take time for this to affect income. Integrate many different aspects of poverty related to the MDGs into a single measure, reflecting interconnections among deprivations and helping to identify poverty traps. According to a new index developed by Oxford University and the UN, Ethiopia under Prime Minister Meles Zenawi is ranked the second poorest country on earth. The new measurement known as the Multidimensional Poverty Index, or MPI, will replace the Human Poverty Index in the United Nations’ annual Human Development Report. The new report says Ethiopia has the second highest percentage of people who are MPI poor in the world, with only the west African nation of Niger fairing worse. This comes as more international analysts have also began to question the accuracy of the Meles government’s double digit economic growth claims and similar disputed government statistics referred by institutions like the IMF. In 2009, the percentage of Ethiopians who are in chronic need of food aid tripled to nearly 20 percent of the population compared to 1990 when the country was ruled by the pro-Soviet communist government of Mengistu Haile Mariam. Despite the reportedly worsening economic and political situation Zenawi government continues to receive billions in aid from the US and other western nations. OPHI and the UNDP Human Development Report launch the Multidimensional Poverty Index or MPI – an innovative new measure that gives a vivid “multidimensional” picture of people living in poverty. The MPI will be featured in the 20th Anniversary edition of the UNDP Human Development Report and complements income by reflecting a range of deprivations that afflict a person’s life at the same time. The measure assesses the nature and intensity of poverty at the individual level in education, health outcomes, and standard of living. OPHI has just concluded a first ever estimate and analysis of global multidimensional poverty across 104 developing countries, and is releasing these results in advance of the Report’s October publication. The MPI can be used to create a vivid picture of people living in poverty, both across countries, regions and the world and within countries by ethnic group, urban/rural location, or other key household characteristics. It is the first international measure of its kind, and offers an essential complement to income poverty measures because it measures deprivations directly. The MPI can be used as an analytical tool to identify the most vulnerable people, show aspects in which they are deprived and help to reveal the interconnections among deprivations. This enables policy makers to target resources and design policies more effectively. Other dimensions of interest, such as work, safety, and empowerment, could be incorporated into the MPI in the future as data become available. The MPI reports acute poverty for 104 developing countries, which are home to 78% of the world’s people. The MPI uses 10 indicators to measure three critical dimensions of poverty at the household level: education, health and living standard in 104 developing countries. These directly measured deprivations in health and educational outcomes as well as key services such as water, sanitation, and electricity reveal not only how many people are poor but also the composition of their poverty. The MPI also reflects the intensity of poverty – the sum of weighted deprivations that each household faces at the same time. A person who is deprived in 70% of the indicators is clearly worse off than someone who is deprived in 40% of the indicators. The MPI is a high resolution lens on poverty – it shows the nature of poverty better than income alone. Knowing not just who is poor but how they are poor is essential for effective human development programs and policies. This straightforward yet rigorous index allows governments and other policymakers to understand the various sources of poverty for a region, population group, or nation and target their human development plans accordingly. The index can also be used to show shifts in the composition of poverty over time so that progress, or the lack of it, can be monitored. The measure, called the Multidimensional Poverty Index, or MPI, will replace the Human Poverty Index in the United Nations’ upcoming Human Development Report. For the past 13 years, the U.N.’s annual report has used the Human Poverty Index, which employs three basic dimensions — length of life, knowledge and standard of living — to measure poverty in developing nations. But this year, the U.N. will use Oxford’s Index: a “multidimensional picture of people living in poverty” that complements income measurements “by reflecting a range of deprivations that afflict a person’s life,” including whether a household has a decent toilet, clean water to drink within 30 minutes on foot, electricity, school-aged children enrolled in school and whether any member of a household is malnourished, say researchers. A household is counted as “multidimensionally poor” if it is deprived of over 30 percent of the ten indicators used by the MPI. Of the 25 poorest countries researchers surveyed, 24 are located in Africa. WHAT IS poverty and when is a person poor? Most would agree that poverty involves not having enough of certain things, or doing without others that richer people take for granted. But what is “enough”, which goods and services really matter, and who should decide these questions—researchers, governments or international agencies—are less tractable issues. Perhaps the poor themselves should have the final word. But this presents its own problems. Tabitha, a 44-year-old woman from a slum outside Nairobi, told researchers from Oxford University that going without meals was “normal for us”. Diminished expectations are only one of the effects of dire poverty. In the world of international development, most have rallied around the “dollar-a-day” poverty line (or more precisely, the $1.25-a-day measure) and its less acute cousin, $2-a-day poverty. These World Bank measures judge a person to be poor if his income falls short of a given level, adjusted for differences in purchasing power. In principle poverty rates based on these measures count the fraction of people in a country who lack the resources to buy a notional, basic basket of goods. Despite the many merits of the $1-a-day measure—not least its simplicity—some argue that looking only at income risks impoverishing the debate about poverty. Such complaints can be overdone. Income clearly matters: it determines how much people can buy and therefore whether they can afford to do the things, like eat enough, that critics of income-based measures think are more important. But rising incomes do not always translate into better health, say, or better nutrition. So there is clearly scope for measures of poverty that directly capture the many different ways in which, to quote Amartya Sen, “human lives are battered and diminished”. A new set of internationally comparable data put together by researchers at the Oxford Poverty and Human Development Initiative at the University of Oxford tries to take Mr Sen’s ideas about “the need for a multidimensional view of poverty and deprivation” seriously*. Aided by the improved availability of survey data about living conditions for households in over 100 developing countries, the researchers have come up with a new index, called the Multidimensional Poverty Index (MPI), which the United Nations Development Programme (UNDP) will use in its next “Human Development Report” in October. The index seeks to build up a picture of the prevalence of poverty based on the fraction of households who lack certain basic things. Some of these are material. Does a family home have a dirt or dung floor? Does it lack a decent toilet? Must members of the household travel more than 30 minutes on foot to get clean water to drink? Do they live without electricity? Others relate to education, such as whether any school-age children are not enrolled or whether nobody in the family has finished primary school. Still others concern health, such as whether any member of a household is malnourished. A household is counted as poor if it is deprived on over 30% of the ten indicators used. Researchers can then calculate the percentage of people in each country who are “multidimensionally poor”. Looking at many aspects of poverty at once has several benefits. One problem with considering just one indicator is that some deprivations may be a matter of choice. As Mr Sen has argued in his work on poverty, what matters is not whether a person eats “enough” but whether he eats whatever he does out of choice. Fasting is fine; involuntary starvation is not. Some, for instance, may prefer the earthiness of a mud floor to the coldness of a concrete one. But the number of people choosing to be malnourished, illiterate, lacking in basic possessions and drinkers of dirty water all at once is probably fleetingly small. A person deprived along many of these dimensions surely counts as poor. By and large, as the chart shows, countries’ poverty rates as calculated using the MPI differ quite a lot from those based on their $1-a-day rates. In India, for instance, many more people lack basic things, as measured using the MPI, than earn less than $1.25 a day. The opposite, however, is true of Tanzania, which is doing better at getting its people fed, housed and educated than its income-based poverty rate would suggest. Since the MPI is calculated by adding lots of different things up, it is possible to work backwards and see what contributes the most to poverty in specific places. In sub-Saharan Africa, the material measures contribute much more to poverty than in South Asia, where the biggest contributor is malnutrition. The authors argue that having this information readily accessible makes it easier for development agencies and governments to decide what to focus on. The MPI also does a better job of uncovering long-term trends. Successful reforms in health or education increase earnings only many years into the future but will show up quickly in the MPI poverty rate. Much remains to be done to refine the idea. For a start, the things the MPI measures are not particularly useful for middle-income countries, which have figured out how to get their people clean water and enough food but where other kinds of poverty still exist. But the principles on which the MPI is based are simple and easily adapted. An index for areas within a single country could draw on more data and could paint an even more nuanced picture: the Mexican government is already using a variant of the index to help monitor the results of its anti-poverty programmes. Measuring poverty is not the same as alleviating it, of course. But the MPI is a step forward. The World Food Program WFP has wrongly believed that the so called famine assurance is the way out from drastic famine in Ethiopia. In contrary to Band Aid’s mid 80’s unsuccessful direct aid approach, WFP engaged a business type marketing methodology by Insuring against hunger (IAH). This supposedly in turn eradicate famine from the the Horn of Africa nation by stopping from arriving chronically by taking out weather insurance policies on behalf of starving subsistence farmers.” Even weather in the horn of Africa is impressible. WFP wrongly advocates this will end the ad hoc nature of aid thus working against a government merely surviving through famine aid even from its inception in the famine camp during struggle in 1980’s. 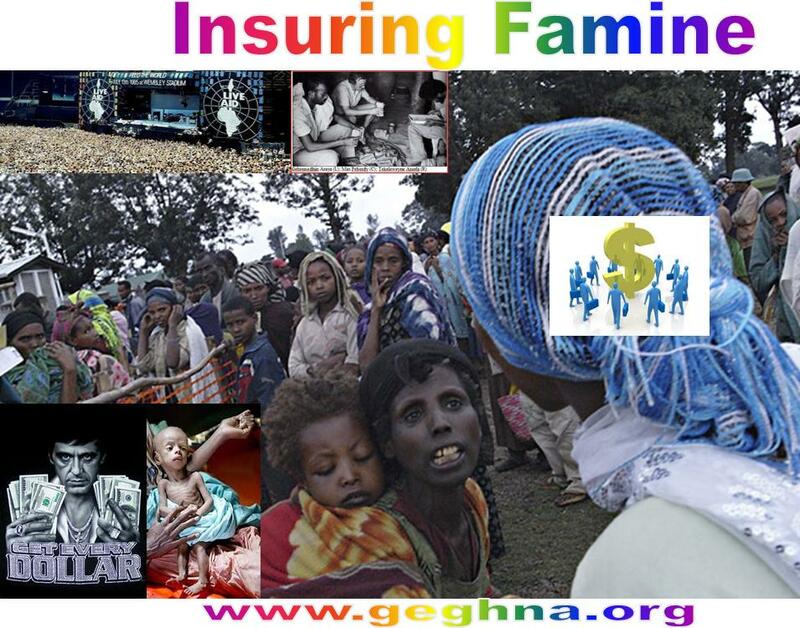 Insuring against hunger (IAH) is a timely profit making on the name of food Aid in Ethiopia. Starting from Band Aid who did not try to make money on the name of the starving in Ethiopia ? And IAH will not be a new phenomenon for the Ethiopian starving dry bones. 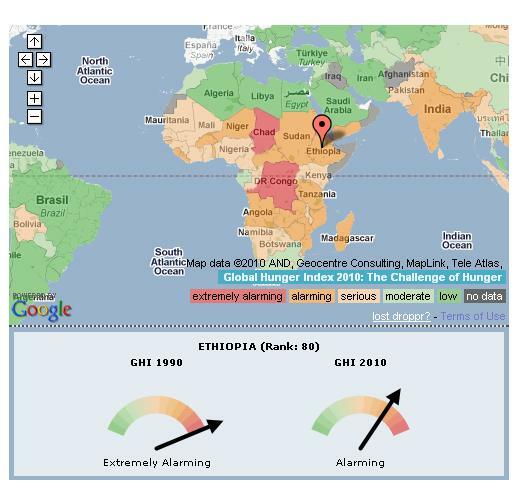 According to IAH group , the program is effective by indexing the assurance of famine to the Ethiopian weather variations which turn triggers the so called payouts for the starving population. Since the most destructive variance occurs early in the growing season, the so call assurance money making assessment can take place well before the harvest how much money its will make. As the confirmed by IAH itself the pastorals are not assured since there is no predictable rain fall in the pastoral areas that is the reason given by the IAH. The truth is that the pastorals does not own land and they are nomadic types,thus one could not grab their land in case of a catastrophe or non payment. While the settled ones IAH could easily take over their land and make them a slave worker in their won farms with the help of dictatorial regime of Melese Zenawie . The so called promise for the future ” remote sensing of vegetation to include pastoral areas ” is just an empty promise. It has been over 5 years now nothing has been done (2005). The pilot IAH has a tribal and regional profile in Ethiopia, since it has been selectively done in region 1 the region of the ruling dictator. Can commercial practices like risk management prevent famine? This the Question to the new manager of the World Food Program who thinks so and is turning to business to revolutionize aid, we are addressing ? Could World Bank finance over 80% of the population in Ethiopia, who are farmers from the population of over 80 Million to be assured by the future donation when famine strike? One thing is sure that as we have seen in the last three governments in (Imperial, Communist, Irridentist) type of government in Ethiopia famine has struck and is striking and will strike a Ethiopia unfortunately. As consequence the Wold Bank and WFP better index not on the weather but on the famine itself, if IAH group are investing to make money in Ethiopa. So the IAH will be sure of its bit. The assurance company will be well assured then rather than indexing the climate, since the weather is not the problem in Ethiopia today. There is ample of rain but there is still famine. The only way to eradicate the Ethiopian famine is to establish a democratic system of government with a free press and democratic uncorrupted institutions as proposed by Nobel Prize laureate Amartya Sen. This is the only way out with out we have to stop betting around the bush and all effort to stop famine in Abyssinia is a nightmare with a dictator on power. In 1984 they cheated the world on the name of famine one to power the other to be rich and famous. If there is international justice they must face right now. We Accuse since they continue to this day cheating the whole world on the name of the dying Ethiopian/African dry bones. Justice delayed is Justice Denied !!! 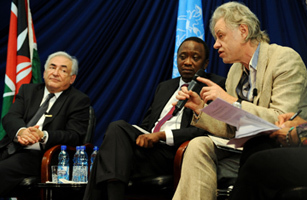 British rock impresario and Africa aid promoter Bob Geldof, a.k.a. “Saint Bob,” was back in the headlines this past week after blowing his stack at the BBC for a story it aired alleging that Ethiopian rebels had diverted 95% of the $100 million in Ethiopian famine relief raised in the mid-1980s — much of it by Geldof’s iconic Band Aid concert. 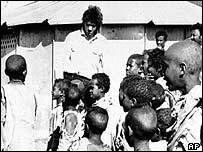 Melese Shamefully tries to deny that he robbed himself to power and he is responsible for 1984/5 million death only 5% of the money from Band Aid arrived for hungry the rest 95% were used to buy arms. From the 95% the lion share went to the fiscal paradise around the world and still lingushing to these days. He rejected the facts, but the truth is after him it wont be long before he pays for his crime…. Bravo Master of deception !!! Meles Zenawi denies that most of a $100m donation was spent on armsThe prime minister of Ethiopia has stepped into the row between Sir Bob Geldof and the BBC which has claimed that 95 per cent of the $100m aid raised, by Live Aid and others, to fight famine in rebel-held northern Ethiopia in 1985 was diverted to be spent on weapons. Meles Zenawi, who was one of the leaders of the rebel group the Tigrean People’s Liberation Front, is now the country’s Prime Minister. In an interview with The Independent he said that the BBC had fallen for lies put out by his political opponents on the eve of a general election in Addis Ababa next month. The rebels were then fighting the army of the Mengistu dictatorship whose troops were mainly conscripts who often ran away and abandoned their weapons when fighting began. “We captured large amounts of guns and tanks. We did not need to buy arms. What we needed was food. So why would we sell food to buy arms?” Mr Meles said. “We needed food because by 84-85 we had an extensive liberated area under our control. But it was terribly hit by famine. The danger was that the population, on whom we depended, would leave the liberated area and go over to the government area in search of food. So we needed the food to keep our people in our area. Significantly, that was a year after Aregawi Berhe had left the area. It was also a year after a photograph was taken showing a Christian Aid worker, Max Peberdy, buying grain from the second rebel quoted by the BBC, Gebremedhin Araya, who claimed he had duped Christian Aid by selling them sacks full of sand. “Gebremedhin Araya was not the head of finance of the TPLF, as has been claimed,” Mr Meles said. “He was in no leadership position. He was just a paramedic.” Christian Aid yesterday disclosed that Mr Peberdy had also left the area a year earlier. Five other leading aid agencies have criticised the BBC report. Oxfam, Save the Children and Christian Aid were yesterday drawing up a joint complaint. Band Aid’s lawyers were preparing an official complaint for the broadcasting standards watchdog Ofcom. A group of Britain’s most respected agencies – including Oxfam, the Red Cross, Unicef, Christian Aid and Save the Children – are joining Band Aid in writing an official complaint to the chairman of the BBC Trust, Sir Michael Lyons. They are to complain of the “false and dangerously misleading impression” created by a report by the BBC World Service’s Africa editor, Martin Plaut, which alleged that 95 per cent of the $100m in aid which went to the northern province of Tigray in 1985 had been diverted for military use by the rebel forces which held the area. The story, which went out in the World Service’s Assignment programme – and in a shorter version on Radio 4 in From Our Own Correspondent, as well as on the BBC website – relies on the testimony of two former senior Tigrean rebels. The most senior, Aregawi Berhe, a one-time commander in the rebel army, was expelled from the guerrilla movement in the summer of 1985. “He therefore not only had a political axe to grind against his former colleagues but he wasn’t even in Tigray at the time,” said Sir Bob Geldof last night, “so he could not have witnessed these alleged transactions”. The anti-poverty campaigner, who raised $144m for Africa in the Live Aid concert in 1985 – which was spent in six different countries – accused the BBC of “wilfully naive reporting”. “This is a Ross/Brand moment in BBC standards for me,” Sir Bob said. “This story has gone around the world on the internet and created a totally false impression of what actually happened. At the time of Live Aid we had journalists crawling all over everything we did trying to find something wrong – and they couldn’t. It was not just the volatile campaigner who was incensed. The BBC story was “outrageous and very damaging,” said Nick Guttmann, director of emergency relief operations at Christian Aid . “It is palpable nonsense,” said Phil Bloomer, director of Oxfam’s campaigns and policy division. “The idea that 95 per cent of aid was diverted is beyond belief. We know because we bought the food, we bought the trucks, we took the food in, saw it distributed and then we drove the empty trucks out. “You have to ask what is the motive of those behind these claims, made by political opponents of the Ethiopian Prime Minister as an election approaches in Ethiopia,” he added. A former British ambassador to Ethiopia, Myles Wickstead, added weight to the aid agencies’ condemnation last night. “I’d give no credibility whatsoever to the idea that 95 per cent of aid to Tigray was diverted,” he concluded. “It was too highly monitored, most particularly that of Live Aid. Some money may well have gone astray in Ethiopia in 1985. But nowhere nearly on the scale which the BBC has alleged. Bob Geldof rages against the “thoroughly discredited BBC World Service programme that claimed that nigh on the entire humanitarian relief effort by all aid agencies during the Ethiopian famine was diverted to arms” (My rage at this calumny, 10 March).But the BBC report was not specifically about Band Aid. Nor does it discredit the World Service to report on international aid deliveries during the Ethiopian crisis of the 1980s. The real issue is about the way humanitarian assistance to victims of war and famine was – and still is – manipulated by all sides, whether rebel or government. Today the we are witnessing for the third time the coming fall of Woyane regime due to all Ethiopian famine. This is due to total nationalization of all the land of Ethiopia. It has been sold today to Land Grabbers 1.5 usd per hectare per year for 48 years, while in India the same is leased for 350 per hectare per year… but in difference to Ethiopia in India the money goes to the people not to the regime. The Woyane government has been deliberately instigating famine which reached in the end of 2009 over 15 million. Like the communist regime of the Derg, Woyane manipulate the aid as a main source of income the last 18 years. Prof. Peter Singer in Famine, Affluence, and Morality in The Journal of The Royal Institute of Philosophy 2002.
mass starvation almost as a matter of course.81 During the early 1970s, the country suffered a series of droughts that put tremendous strain on its food supply. Emperor Haile Selassie and his government by and large ignored the resulting hunger.82 They paid a price for this indifference; by exploiting national unrest fueled in part by starvation, a Communist-led uprising overthrew Haile Selassie and, after a few years of internecine fighting, the Dergue, an extreme left-wing faction, took over. The Dergue, led by Col. Mengistu Haile Meriam, embarked in the late 1970s on a radical Marxist redistribution of property and collectivization of agriculture, echoing Stalin’s “reforms.”83 True to the Soviet model, the state levied large grain quotas on farmers, subjected them to heavy taxation, and forced them to sell grain to the government at greatly undervalued prices.84 These policies destroyed incentives and led to dramatic falls in productivity.85 It was not so clear as in Stalin’s case that the government had declared war on its own citizens. 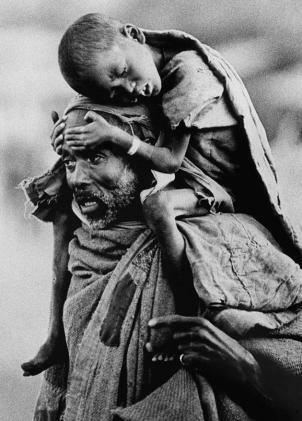 However, the misguided adherence to Communist dogma by an inept regime eviscerated individuals’ preexisting abilities to feed themselves while the government took no corresponding action to provide an alternative.86 This government-manufactured food shortage, however inadvertent, left Ethiopians increasingly vulnerable to exogenous faminogenic shocks by the early 1980s. Such a shock came in the form of severe drought. It is tempting, but incorrect, to hold this natural disaster liable for the famine that ensued.87 Other parts of sub-Saharan Africa were hit at the same time— neighboring Kenya suffered the same drought as Ethiopia—without an outbreak of famine.88 The Dergue’s disastrous macroeconomic policies made Ethiopia particularly susceptible. The forcible expropriation of property in the form of high grain quotas and excessive taxation, combined with artificially low market prices due to government constraints, prevented farmers from either keeping their grain for themselves or selling it for enough to buy food. Faced with poor weather, peasants were defenseless, unable to exercise their traditional “coping” mechanisms to mitigate the effects of drought.89 A report on the famine labels these as longterm causes, finding that hunger was due to the deterioration in the productive capacity of the peasant populations and the elimination of traditional methods of coping with predictable fluctuations in climatic and environmental factors. “Foremost among these factors were government programs, redistribution of land, confiscation of grain and livestock through excessive taxes and obligations, and coercive labor programs and a decline in available labor force.”90 As Clay and Holcomb observe, “Famine . . . resulted primarily from government policies . . . implemented in order to accomplish massive collectivization of agricultural production and to secure central government control over productive regions of the country where indigenous peoples have developed strong anti-government resistance.”91 These government policies, while perhaps not intentionally faminogenic, were pursued in spite of significant evidence that they were leading to disaster. After years of such malpractice, the consequences were made clearer and clearer to the government.92 Still, in 1985, after the famine was already in full swing, the Dergue authorities persisted with their disastrous policies.93 But the Dergue was not just recklessly indifferent. The famine did not strike all of Ethiopia equally but, rather, was targeted at Wollo and Tigray, with a sharp, but brief, episode in Eritrea.94 Not coincidentally, these three areas were homes to separatist rebellions that were assailed in accordance with a withering counterinsurgency strategy. The fierceness of the famine in these combat zones arose out of the Dergue’s deliberate use of starvation as a weapon. JEAN DRÈZE & AMARTYA SEN, HUNGER AND PUBLIC ACTION 46 (1989). ================= The Royal Swedish Academy of Sciences on its award of the Nobel Prize for economics to Amartya Sen. The Prize will be presented to Dr Sen in Stockholm on Thursday. Amartya Sen has made several key contributions to the research on fundamental problems in welfare economics. His contributions range from axiomatic theory of social choice, over definitions of welfare and poverty indexes, to empirical studies of famine. They are tied closely together by a general interest in distributional issues and a particular interest in the most impoverished members of society. Sen has clarified the conditions which permit aggregation of individual values into collective decisions, and the conditions which permit rules for collective decision-making that are consistent with a sphere of rights for the individual. By analysing the available information about different individuals’ welfare when collective decisions are made, he has improved the theoretical foundation for comparing different distributions of society’s welfare and defined new, and more satisfactory, indexes of poverty. In empirical studies, Sen’s applications of his theoretical approach have enhanced our understanding of the economic mechanisms underlying famines. Can the values which individual members of society attach to different alternatives be aggregated into values for society as a whole, in a way that is both fair and theoretically sound? Is the majority principle a workable decision rule? How should income inequality be measured? When and who can we compare the distribution of welfare in different societies? How should we best determine whether poverty is on the decline? What are the factors that trigger famines? By answering questions such as these, Amartya Sen has made a number of noteworthy contributions to central fields of economic science and opened up new fields of study for subsequent generations of researchers. By combining tools from economics and philosophy, he has restored an ethical dimension to the discussion of vital economic problems.